Couscous is traditionally steamed and fluffed to separate the granules. Boiling and stirring can reduce quick-cooking couscous to a sticky, starchy mush. Like pasta, couscous does not have much of a flavor itself. 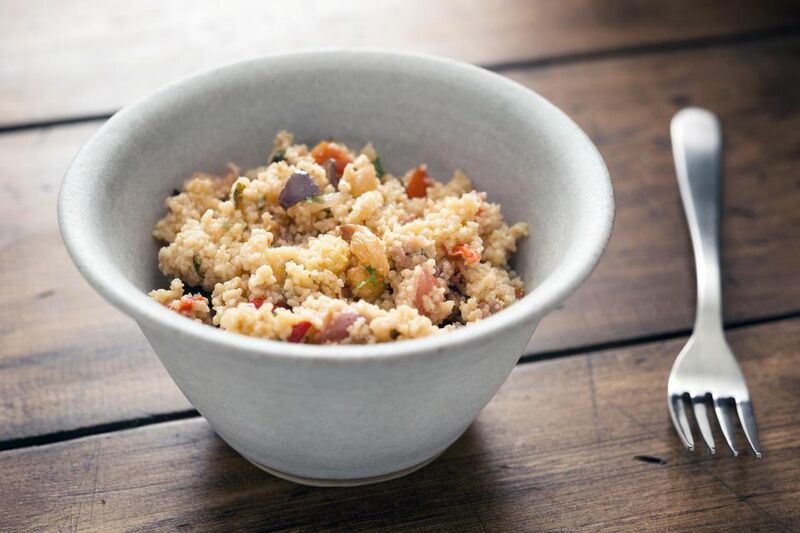 Thus couscous dishes are made with flavored stocks, herbs, and spices, with vegetables, dried fruits, nuts, and/or meat added or used as a topping. Most packaged couscous is considered the instant variety and will cook very quickly off the stove by absorbing a boiling liquid. However, authentic couscous (roughly-ground hard durum wheat) will require significantly more time and a good steaming vessel called a couscoussiére. Be sure to identify which type of couscous you have purchased (instant or traditional) to properly plan cooking time. Couscous may also be cooked like rice. Heat butter, add couscous and stir to coat, add stock, bring to a boil, reduce heat to lowest setting, cover, and cook (no peeking!) until liquid is absorbed. Fluff to separate. If you lack a steamer, a heat-proof colander inside a stockpot will work fine. Line the colander with cheesecloth if the holes are too big. When using the long traditional method of steaming couscous, covering the pot is not recommended as the condensation can drip onto the grains and make the couscous mushy. As well as a carbohydrate-laden side dish, couscous may also be eaten as a porridge, in salads, or in desserts. To double or triple the volume of instant couscous, avoid the hot water method given on the box and take the time to slowly steam it. Cooked couscous should be eaten within a couple of days. It may be frozen up to three months. 1 cup dry couscous = 2 1/2 cups cooked. As a side dish, plan on 1/2 to 3/4 cup cooked couscous per person.